If you'd like a drone to bring you a burrito at 2 a.m., the Trump administration is taking a step toward making that possible. It's also making it easier for local governments to have a say in whether deliveries should even be allowed. The White House announced Wednesday it's launching a three-year pilot program to create "innovation zones" for test drones around the country. The move aims to spur the development of the drone industry in the United States. Many drone companies have moved their operations overseas amid complaints that U.S. regulators are too slow to allow the new technology. In the pilot program, state, local and governments will partner with drone companies to evaluate operating at night, taking flights over people, and flying outside a pilot's line of sight. Package delivery is a possible service under consideration. The U.S. Department of Transportation will field applications for the program and grant at least five partnerships. This means, in theory, Google and the city of Detroit could be inspired to team up to offer burrito deliveries. The program is a step toward resolving who is in charge of what drones do. The federal government has long governed the skies rather than state and local leaders. The approach works as planes fly thousands of feet above the ground, so they have little impact on matters below. But small drones complicate things -- they can fly directly above homes, sidewalks, and public events. Many state and local governments have pushed for a say in how drones are regulated. "This is a clear recognition that drones are different than manned aircraft and the regulatory structure needs to reflect that," Gregory McNeal, a co-founder of the drone startup AirMap and law professor at Pepperdine University, told CNN Tech. If cities and states have no say in when and where drones fly, troubling situations could result. 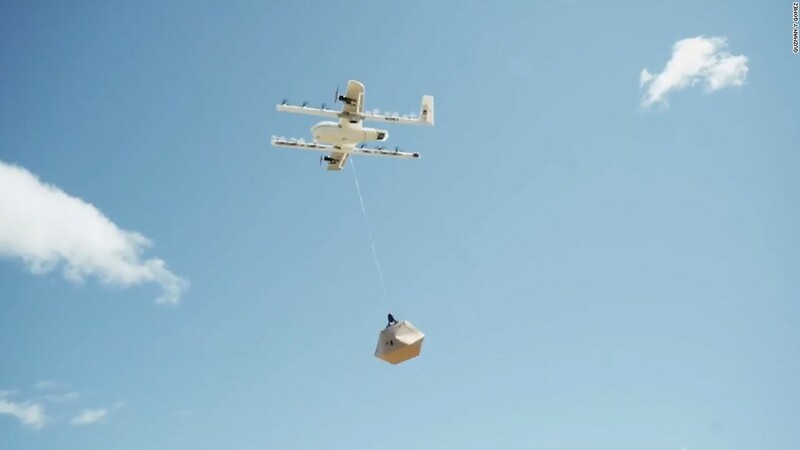 For example, a fire department responding to a blaze may not be able to launch a drone because another one is delivering a package nearby. Some cities are also concerned they won't be able to restrict drone flights at certain times, such as during parades, fireworks displays, sporting events and public gatherings. To address these concerns, pilot tests will include restrictions surrounding when and how drones are flown. The program will help the federal government better understand how local governments can be involved. In a classic script, drone technology has developed faster than related regulations, forcing governments to play catch up. DJI, the world's drone maker, announced a new technology Wednesday that could make it easier for law enforcement to ensure drones are being used safely. DJI's AeroScope system creates a virtual license plate for drones. Law enforcement can use a suitcase-sized device to monitor all DJI drones within five kilometers, and know who is flying it, where it's flying and its purpose. Perhaps a police officer on your block will one day know if that drone headed toward your backyard just wants to drop off a chicken burrito.